What types of documents can infoRouter manage? infoRouter allows users to create, manage, share and distribute any form of electronic document using any desktop software or tool. and virtually any other file format can be stored and managed in infoRouter. Best of all, all document formats are managed in their own native format so there are no conversion requirements. Regardless of document type, infoRouter can manage document versions, apply and enforce access and permission on any type of document. Yes. You may send Outlook emails directly from Outlook into infoRouter using the Office Add-in for infoRouter. Emails in infoRouter are stored and managed just the way other documents are. Emails are stored with their attachments and all attachments are included in the search indexing. All common email fields are captured from indexing as well. are automatically captured, stored and indexed. This way, you can search for emails by specifying any of the fields above to quickly find what you are looking for. Click here to read more about MS Outlook Add-in for infoRouter. infoRouter also offers a stand alone product called the infoRouter Email Scanner. This tool monitors configured email accounts and automatically pulls in emails from an email server. The emails are then pushed into configured infoRouter folders. Click here to read more about infoRouter Email Scanner. Does infoRouter offer Version Control? Yes. Using infoRouter you may upload or create multiple versions of a document. You can revert back to earlier versions of documents with just a few clicks, compare different versions, and even audit changes to your documents. The document history tool displays every version with dates, times and authors. Detailed information on each version is stored for audit. There is no limit to the number of versions that you may create and store. Users with appropriate access or owners of documents may delete older versions. The System Administrator can also run a built-in utility called "Compact" to automatically get rid of unwanted versions of documents within folders and libraries. This function reclaims disk space by deleting earlier versions, leaving behind a specified number of versions. Click here for more information about infoRouter Version Control. Is infoRouter security like Microsoft Windows Server security? Yes. Administrators or users with administrative rights (through assigned roles or object ownership) can easily manage document and folder security in infoRouter. It all starts at the document library level where only the assigned members of a library can access or even see a document library. Once a user is a member of the library and can access the library, folder and document level security takes over. Permissions can be assigned to individual users and user groups. In addition to standard user groups, there are built-in system user groups that allow its members spoecial rights. infoRouter security changes are tracked and audited so you may easily find out who applied the current and previous security assignment. Can infoRouter help in Configuration Management? Yes. infoRouter includes many tools and features to manage document folders with point-and-click ease. Administrators, project managers, document coordinators, and other users with proper access can manage and control the process of document generation in their folders. Using Smart Folders, configuration rules can be enforced at the folder level to maintain the structure and integrity of documents and folders. By setting folder rules, you can even specify what types of documents are allowed in a folder. These rules are also (optionally) inherited by sub-folders. A folder may be configured to allow only PDF documents whereas another folder may allow only images such as the JPG format. This prevents folders from being haphazardly populated by different types of documents. Folder owners may also control editing activities by setting flags on their folders to prevent the check out of documents. You may even prevent checked out documents from being checked in, effectively freezing the folder. Because folder rules override individual user permissions, folder rules are and effective tool to control structure and content. Searching for documents is a problem. Can infoRouter help? infoRouter is like a search engine for your company’s internal documents. Using the search capabilities of infoRouter, users can search for and locate documents instantly. The advanced search tool allows users to specify keywords, authors, time periods and many other parameters to find documents easily. The integrated full-text search functionality allows users to locate documents by specifying words or phrases to perform content searches. In addition to content search, infoRouter can find documents by using a vast array of indexed information it stores on documents. Even comments written for documents are included in the search index. You can search for documents based on Meta Data assigned to the document. Imagine being able to search for invoice documents based on their amounts. Even in ranges. Find all documents of type "Invoice" with an amount greater than $125. Find all documents of type "Memo" only the ones I have not see before. Does infoRouter support email notifications? Yes. In environments where changes to documents must be instantly communicated and tracked, the infoRouter subscription mechanism allows users to sign up for instant email notifications. Users can sign up for email notifications for multiple events such as new documents, changed documents, approved and rejected documents to name a few. Any time one of these events come true, infoRouter sends out an email notification to all subscribed parties. This feature is especially useful in time-sensitive documents such as project documents or pricing documents. When changing information such as revising budgets, price lists etc., the author does not need to remember to distribute the document to all interested parties. Can we track changes to documents and folders? infoRouter tracks every document for every user. As you navigate through folders, you can instantly tell that documents have changed, or that new documents have been created. New documents or updated documents appear in BOLD. infoRouter users can subscribe to documents and folders for instant notifications. The powerful subscription mechanism can be configured by each user to get alerts on various events. These events include approvals, rejections, checkouts, reads and the list goes on. This mechanism allows for supervisors and managers keep track of every activity surrounding a set of documents.Tracking changes to project documents, proposal or bid documents that must be closely monitored for accuracy is abreeze. The Audit Logs also provide a detailed list of activities related to documents and folders. Virtually all user activity is tracked. Views, Deletes, Moves, Check In and Check Outs, Revisions, New documents, New folders, etc. are all tracked. You may view all previous versions of a document and get information on who performed the changes and when the changes were made. With infoRouter you will get unprecedented control over your documents. I have a lot of documents; do I have to import them into a repository? You can use the simple and fast Import/Export Tool to import your existing documents into the infoRouter repository. This tool allows you to import your existing documents into infoRouter keeping their existing folder structure. Users can use WebDAV to quickly drag and drop their desktop documents into infoRouter. Can I assign additional properties to documents? Yes. infoRouter allows you to create custom property sets that are unique to you. Custom Property Sets consist of a series of meta-data fields that you define. Custom properties can be assigned to individual documents, a folder or even a library. Folders can be configured to automatically prompt for document properties so every time a user uploads a document into these folders, users are automatically prompted to enter custom property values. Using Custom Properties, documents can easily be searched for and located. Invoices, project documents, customer records and many other critical documents can be easily found using custom properties. Click here for more information and usage scenarios for Custom Properties. Can a file size limit be set on uploading? Yes. A global parameter determines the maximum file upload size limit. Setting it to 0 will allow the users to upload a file of any size. Any other value will determine the upload limit. Does infoRouter support document scanning? infoRouter includes several tools to support scanning, imaging. Scanning and imaging is an integral part of infoRouter document management software. infoRouter Scan Station is the flagship scanning tool that supports many features to help operators process scanned documents. infoRouter Hot Folders tool is another effective tool that runs in un-attended mode to monitor file system folders.These file system folders may be used as output folders by automated processes or scanning workstations. Hot Folders automatically reacts to new documents and processes these new documents. This tool can be configured to process different Meta formats and submit documents to infoRouter folders. Hot folders is capable of handling all types of documents, not just scanned documents. Does infoRouter support electronic forms? infoRouter supports HTML form templates which is a very powerful tool to help create content without having to worry about formatting. Users simply enter text or numbers in the form fields and save the form. infoRouter creates formatted output in HTML format. Form templates can be designed to render documents using different form templates of PDF templates. This provides a very flexible environment to create formatted documents that comply with corporate guidlines. To read more about Electronic Forms Management in infoRouter click here. Does infoRouter support conversion of documents to PDF? infoRouter supports the conversion of HTML and image (TIFF, JPG, BMP) documents into PDF. infoRouter also has the capability to fill in PDF forms. This feature can be used in conjunction with the forms management capabilities of infoRouter to deliver effective solutions. infoRouter can fill PDF Acro Forms, create PDF files from HTML documents and Convert TIFF files to PDF. infoRouter includes a PDF Conversion Service that must be installed in order to convert various document formats to PDF. Does infoRouter support LDAP Authentication? Yes. infoRouter can authenticate users from LDAP. infoRouter can authenticate users from LDAP allowing administrators freedom to maintain one user id and password for each user. With many applications that require authentication, LDAP authentication is a is a powerful mechanism. infoRouter LDAP integration includes an LDAP Synchronization Manager tool that automatically scans for changes in LDAP and automatically communicates these changes to infoRouter. The two systems automatically stay in sync. Note: infoRouter can authenticate against multiple LDAP Servers. To read more about infoRouter LDAP authentication and Synchronization, click here. Does infoRouter integrate with MS Office? infoRouter seamlessly interfaces with MS Office products and tools. Using the Office Add-in, users may create documents in Word and directly save their documents into infoRouter. Similarly, Excel and PowerPoint documents may be saved into infoRouter without even launching infoRouter. Emails in MS Outlook may be pushed into infoRouter without having to launch infoRouter. The integrated Workflow Management Software built into infoRouter will help you manage your documents and business processes more effectively than ever. You may create recurring workflows for ISO Document Control or regulatory compliance purposes where documents are passed around automatically and are reviewed by the defined users until the document is either rejected or approved. Users may simply be required to digitally sign the documents indicting that they have seen, reviewed and approved the contents of documents. Users with appropriate access can track these documents and their current workflow statuses. Is infoRouter EDMS compliant with HIPAA? HIPAA (Health Insurance Portability and Accountability Act) requires that the handling of sensitive patient records are documented. Access to records are subject to strict controls and all access to any record is tracked. infoRouter protects every document and folder through extensive security and permission tools. Once access is granted, infoRouter tracks all access to every document and provides extensive reports and logs. Organizations must provide an environment that facilitates safe electronic storage, safe access and routing of patient information and records. infoRouter is the perfect environment that facilitates these requirements. Is infoRouter DMS compliant with 21CFRPart11? Active Innovations, Inc, provider of the infoRouter Integrated Document Management System, is committed to partnering with our customers in meeting our mutual goal of the design and production of products of the highest quality and reliability. Many of our customers in FDA-regulated industries, such as the design and manufacturing of pharmaceutical and medical device products, rely on infoRouter as an integral software tool within their Research and Development and Quality Assurance processes. infoRouter aids organizations in their compliance efforts by meeting all of the requirements of 21 CFR Part 11. Active Innovations, Inc., through its solution providers and in-house Technical Services group, provides software validation services as part of the deployment of infoRouter Enterprise Server. infoRouter Document Management System provides an integrated document management system for the storage, approval and archiving of data, results, reports, SOPs and any other type of document. infoRouter Document Management System satisfies all of the 21 CFR Part 11 requirements. To read more about infoRouter 21 CFR Part 11 compliance click here. Is infoRouter DMS compliant with DoD5015.2 Records Management Guidelines? infoRouter is fully compliant with the DoD 5015.2 STD guidelines. infoRouter records management features have been designed and developed to be compliant with various guidelines such as the DoD 5015.2 and VERS. Handling incoming documents, assigning document types, routing to workflows, retention and disposition schedules to name a few are standard features of infoRouter records management. For more information on Regulatory Compliance click here. For more information on Records Management click here. What are the System Requirements for infoRouter? infoRouter is highly scalable and operates on industry-standard Windows platforms. The basic configuration is a single server to support IIS, the DB engine and the warehouse. However infoRouter is a flexible platform that allows multiple configurations. High speed storage arrays are also supported to store the document warehouse. We recommend using a dedicated server for infoRouter. For detailed information on infoRouter system requirements click here. What is a typical implementation timeframe? The installation of the Server Software takes about 15 - 20 minutes. No client installation is required because infoRouter is a server side application which is entirely web based. You must plan for the new folder and document structure. This entirely depends on the existing content you are planning to migrate to infoRouter. Importing your NT Users and groups can be easily accomplished using a built in tool. Creating form templates and custom properties all depend on your specific requirements. Can users and user groups be imported from LDAP? Yes. infoRouter includes a tool to import and synchronize LDAP Users and Groups. Using LDAP Authentication, your users will not have to maintain another password. infoRouter has a built-in user LDAP. You may prefer to authenticate outside users from infoRouter and your internal users from LDAP. Do we need a System Administrator? Yes. A System Administrator is needed to maintain infoRouter. However, this does not have be a full-time job for one individual. Most functions of infoRouter can be delegated to other users. Most of our customers find that the infoRouter System Administrator job is about 25% of an FTE. The system administrator can assign Library Managers for each Library in the system. Library Managers can perform most of the system administration function for their libraries. Library Managers can create local users, local groups and manage most of the critical functions required to manage a library. Because only the System Administrator can create global users and global user groups, the library manager has to defer to the system administrator when the management of these objects are required. Is training recommended for system administrators? Training for System Administrators is not required. Our comprehensive documentation and on-line Help system will be sufficient for an administrator with experience in managing an network. Training requirements for users of infoRouter are even less. Our intuitive user interface has been designed to be natural for typical knowledge workers. Are basic training materials available for distribution to users? Yes, we provide multiple electronic forms of user and administrator documentation. User documentation is in the form of on-line help. One of our major objectives in developing this system was ease of use. An average Windows user should be able to perform basic tasks in infoRouter instantly, and the more advanced features are also well documented. Do you offer an upgrade program? Are all upgrades backwards compatible? Yes. All Minor and Major Upgrades are provided using our Live Update feature. Live Update releases address any known issues or bugs, cosmetic changes, navigational improvements, and all softwre enhancements. Major Upgrades usually come in the form of module additions or major enhancements to multiple sections of infoRouter. Customers who participate in the infoRouter Subscription and Maintenance program receive all upgrades free-of-charge for as long as they are in good standing. What Support Services do you provide? We do not for charge for implementation support. Ongoing support is covered under a Maintenance Agreement. The maintenance support agreement offered at this time is a Subscription Agreement that allows participating customers to obtain all Live Update patches and new versions for as long as they are on maintenance. Our web site and issue reports submitted through web forms and emails are monitored around the clock by our New York, London, Ankara and Sydney offices. All issues are acknowledged within 24 hours during regular business days excluding holidays. When was infoRouter first released? What is the current version? 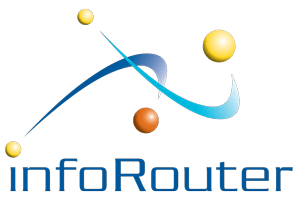 The first release of infoRouter was in June of 1998. Version 2.0 was released in August 1999. These versions were Windows GUI versions. Our Web version was released soon after that in December of 1999. We skipped a version when we launched the Web version. We make around 6 minor releases every year via our Live Update tool. This tool allows us to release minor patches and enhancements on an ongoing basis. Is infoRouter offered as SAAS, or can I run it in my own environment? infoRouter is NOT a hosted service and Active Innovations, Inc does not provide application hosting services. infoRouter is a licensed software that you must download and install on your server. You may host infoRouter with a third-party hosting service under special circumstances provided that you do not violate any or part of the infoRouter license agreement. To review our latest pricing and licensing methods, please see our Software Licensing section. infoRouter licensing consists of a Server License and Client Access Licenses (CALs). The minimum configuration is a 10 user system. Can infoRouter be used to provide a service? You may provide your clients or vendors access to infoRouter as a part of your normal business practice. Whatever the nature of the provided access may be, you may not charge a fee to provide access. You may not provide "Document Management Services." using infoRouter. Please contact our Sales office for special licensing issues and questions. Do you provide an Evaluation Version/Trial Copy of infoRouter? We believe that organizations should evaluate software freely before making the decision to invest in a long-term solution. That is why we encourage our prospects to see the power of infoRouter for themselves before making a commitment. The trial version of infoRouter does not impose any limitations. Can we bundle infoRouter into our software or service? Does infoRouter convert or require the conversion of documents into an image? No. infoRouter supports all types of documents in their native format. infoRouter does however have the ability to convert images and HTML files into PDF. How does infoRouter store documents? All infoRouter documents are stored on the file system. infoRouter stores all documents in its warehouse. The warehouse folder does not have to be shared. All versions and some meta information related to the document are all stored in the warehouse in the original file format without requiring any conversions. Are infoRouter documents managed in their native format? Yes, all files stay in their native format and can be reached immediately. No conversions are applied and no alterations are made to the contents of documents. Optionally certain types of documents (images, HTML and Text) can be rendered in PDF format but the original file format is never changed. All documents in infoRouter can be edited in the native application that generated the document. Unlike other systems that require some sort of conversion, infoRouter can manage all types of documents. Is there a formula you can give us for determining storage requirements? Documents imported into infoRouter will occupy exactly the same amount of disk space prior to the import. Based on the rate of activity, and the number of different versions that may get generated, this number can increase very quickly. Your System Administrator must monitor this growth and provide additional resources as needed, or use the Compact utility to get rid of unwanted versions and reclaim disk space. Indexing will take up to 1.5 times the amount of disk space taken up by documents and their versions. Database space requirements are relatively low. Meta Data such as custom properties, security, document properties are kept in the database. What type of mail protocol is used for email notifications? We use SMTP to deliver notification emails. We can use the SMTP server on the server which infoRouter runs or you can specify a remote SMTP server. We would like to create documents from other sources automatically. Is this possible? Yes. Using the Web Services API, you may build custom applications or use existing applications to feed content into infoRouter. You may also manually import documents from other sources. May we modify the look/feel of the infoRouter interface? Using our easy to use Portal Management module, you can build multiple portals for your internal and external customers. Portals can be configured to reflect corporate colors, logos and images. Using portals, you may control the content that each member accesses.